Undoubtedly the most attractive 15 carat amethyst gem that you will ever come across. 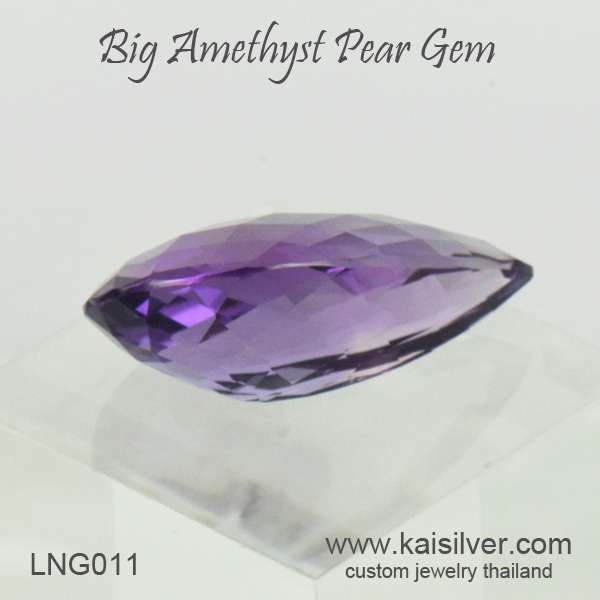 The highly talented gem artist working on this big pear shaped amethyst gem, threw aside conventions related to the proportions recommended for gemstone dimensions. 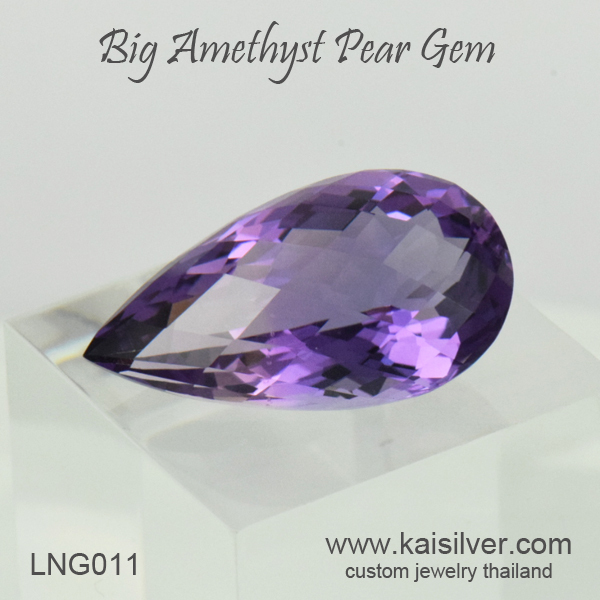 By assigning 25x12mm dimensions to this gorgeous amethyst gemstone, the artist instantly imparted a classy touch to the large pear shaped gemstone. The 13mm depth became necessary to ensure that, the gemstone was durable enough to be set and worn in a gorgeous jewel. As expected there would be a lot of broken pieces in the process before the perfect piece was completed. Besides showcasing the awesome natural beauty of the amethyst, the gem also displays the intense concentration and high skills applied by the gemstone artist. If you happen to be a gem lover with some knowledge about gems and gemstone cutting, you would agree that the 510 U.S$ price tag on this large pear shaped gem is very reasonable. Our support team at sales@kaisilver.com would be glad to answer any questions that you might have. Widely regarded as the leading online provider for high end custom made jewelry, we custom make all jewelry in gold or 925 silver with design and gems of your choice. Depending on the capacity available in our production line, we occasionally accept orders for custom cut gemstones. Unique fancy cut gems cannot be sold at the per carat market price since, these gems are truly unique and utilize the services of some of the most competent gem artists in the industry.